Behavioural genetics; the clue to the difficulty is in the name. As with Sociobiology and Evolutionary Psychology before it, the squashing together of two very different levels of understanding into a single discipline creates a real problem. Genetics and psychology are both respectable fields of study with their different methodologies and evidence bases but they are explaining phenomena at different levels. Aggression, alcoholism, religiosity… these are evidently socially determined and contextual behaviours subject to change and multiple complex influences over time. Investigating them reductively is difficult as they simply won’t keep still or fit into neat categories, even in single individuals. How useful is it to try to explain such complex social-level behaviours with reference to the much ‘lower’ molecular or genetic level? Such translations are sometimes possible; for instance we accept that drugs can affect behaviour, and pharmacologists and psychologists can provide connected chemical and physiological explanations of these effects. But to be convincing, such explanations across levels need to be susceptible to robust investigation and provide very credible causal mechanisms. And then there’s intelligence. If we could even agree on a definition, it would certainly be a complex, changing set of socially determined skills which are the result of development within social and cultural settings and shaped by many human influences and interactions over time. Parenting, education and peer groups would be just a few of these influences. Is it really possible that such complex phenomena can be usefully summed up by a single number on a linear scale? These are some of the problems with the search for a single measure of general intelligence and why it seems so unscientific. 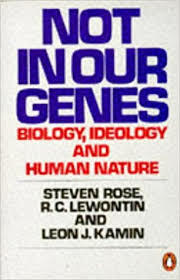 These concerns are confirmed by a reading of classics such as Stephen Jay Gould’s ‘The Mismeasure of Man’ or ‘Not in our Genes’ by Stephen Rose, Richard Lewontin and Leon Kamin and any number of other scholarly contributions. So, surely the simplistic notion of intelligence as a single defined ability with a substantial genetic component has been definitively laid to rest? Well, apparently not. Uncritical talk of IQ and its genetic basis seems to be experiencing a revival. Has something changed? Is there some compelling new evidence which should lead us to revise a judgement that IQ test scores tell us little more than how good the sitters are at taking such tests? Have new mechanisms been found to demonstrate causation where there was only correlation? We should be open to new hypotheses and there’s no harm in revisiting the evidence. However, in doing so, we can be forgiven for being very cautious because IQ testing has such a shameful track record. The long history of the use of such tests to justify racist, sexist and classist prejudices and discriminatory social policies is well documented, including in education. The 11+, which has a lot in common with IQ tests, is still used in parts of England to separate 11-year olds into two groups and decide which of two very different types of school they should attend, offering them different educational opportunities on the basis of this single measure of their ‘ability’. In a piece on The Conversation website in July 2016 entitled: ‘Your genes can help predict how well you’ll do in school’ a researcher from the Centre for Social, Genetic and Developmental Psychiatry at King’s College London describes genetic studies which aim to ‘better understand differences in students’ performance’ and will help us ‘predict specific learning abilities such as reading and mathematical ability’. She concludes: ‘hopefully we will be able to create more powerful polygenic scores in the near future to predict even more of the individual differences in educational achievement’. Presumably when these polygenic scores are available, experienced English and Maths teachers across the country will be expected to ditch what they have learned and change their practices. A 2015 Scientific Report in the journal Nature from the same Centre at King’s College announces: ‘Genetics affects choice of academic subjects as well as achievement’. The team claim to have shown that young people’s decision to study A-levels and their choice of A-levels subjects shows substantial genetic influence as does their performance in those courses. Based on the study of over 6,000 twin pairs they found that these decisions are ‘highly heritable’ and conclude that this suggests ‘a genetic way of thinking about education…based on…genetic propensities’. Anyone who has worked with students making these post-16 decisions will know of the many social and cultural factors, assumptions and expectations which come into play in the process. We also know of the high correlation between A-level achievement and prior GCSE achievement. It seems particularly obtuse to be leaping straight to a ‘genetic way of thinking’ to explain all this. One can only suggest that these folks get out a bit more and take a slightly broader view of the issue they’re researching. Isn’t it obvious that they’re looking in the wrong place? This is not to dispute the results of any experiments or any of the calculated correlations but to question the assumption of causation and the subsequent interpretation and application. It’s not enough to say: ‘it’s Science – you can’t argue with Science’, the onus is on the advocates of the importance of such data to demonstrate their meaning and their usefulness. At the interface of the genetic and the social, as at any other level boundary, there will be a tension between the emergentist who wants to say: ‘things are actually very different at the next level’ and the reductionist who wants to show that: ‘things are really quite simple’. It’s not easy to persuade those searching for simple causes that there might be more complex ones. It may sound a bit wishy-washy to respond to hard experimental data by saying ‘aren’t we missing something – isn’t it more complicated?’ but that’s exactly what we must do before moving between levels. What claims are being made about the usefulness of heritability data, ‘general intelligence’ or IQ? How robust are these claims in the real world of these phenomena? What policies or practices are being advocated as a result of these claims? In the case of intelligence, the lumping together of very different social behaviours and labelling them as one simple thing (the process of reification) combined with the seeking of simple causes for complex phenomena feels like several steps too far. We are right to be suspicious of any behavioural, social or political claims derived from IQ or genetic data. The concept of ‘general intelligence’ is so poorly defined to begin with that it isn’t in a position to be translated from the behavioural level to the genetic level or to be taken seriously by educators. The hereditarian fallacy is not the simple claim that IQ is to some degree ‘heritable’. I have no doubt that it is. The hereditarian fallacy resides in two false implications drawn from this basic fact: 1. The equation of ‘heritable’ with ‘inevitable’…heritability says little about the range of environmental modification to which these traits are subject. 2. The confusion of within- and between-group heredity… Variation among individuals within a group and differences in mean values between groups are entirely different phenomena. One item provides no license for speculation about the other. The products of one human generation’s intelligence and creativity have been placed at the disposal of a subsequent generation and the horizons of human achievement have been therefore extended. The intelligence of a schoolchild today, in any reasonable understanding of the term, is quite different from, and in many ways much greater than that of his or her Victorian counterpart…Its measure is itself historically contingent. Alfred Binet, the founder of IQ testing, once protested against ‘the brutal pessimism’ that regards a child’s IQ score as a fixed measure of his or her ability, rightly seeing that to regard the child as thus fixed was to help ensure that he or she remained so. Suppose that developmental biology were to reach the point where the developmental response to environment of specific human genotypes could be specified with respect to behaviour…the characteristics of an individual could be predicted, given the environment. But the environment is a social environment…the laws of relation of individual genotype to individual phenotype cannot by themselves provide the laws of the development of society. In addition, there must be laws that relate the collection of human natures to the nature of the collectivity. The problem of social theory disappears in a reductionist world view, because to a reductionist, society is determined by individuals with no reciprocal path of causation. High heritability of a character need not say anything about genes. The genetic view is usually a chance of blaming the victim; a way of excusing injustice because it is determined by nature. If the history of medical genetics teaches us one lesson, it is to be wary of …such slips between biology and culture. Humans, we now know, are largely similar in genetic terms – but with enough variation within us to represent true diversity….Tests that are explicitly designed to capture variance in abilities will likely capture variance in abilities…but to call the score in such a test ‘intelligence’… is to insult the very quality it sets out to measure. Genes cannot tell us how to categorize or comprehend human diversity; environments can, cultures can, geographies can, histories can. The heritability of a trait, no matter how strong, may be the result of multiple genes, each exerting a relatively minor effect…while some combination of genes and environments can strongly influence it, this combination will rarely be passed, intact, from parents to children. This entry was posted in Education, Science and tagged behavioural genetics, determinism, Education, emergence, genes, heritability, intelligence, IQ test, Leon Kamin, neuroscience, neurotrash, reductionism, Richard Lewontin, Science, Siddhartha Mukherjee, Stephen Jay Gould, Steven Rose. Bookmark the permalink. 1 Response to Challenging IQ. You didn’t say it was racist that was unfair of me.